BLOG - BETWEEN A ROCK & A HARD PLACE: Rab Noakes Goes Backstage! Backstage at The Green Hotek, Kinross. 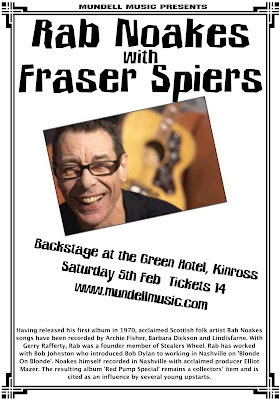 Not that you would know it from his lean rock’n’roll physique but Rab Noakes is now in his sixties. His four decades of involvement in music have been marked by two recent releases: a second album with his occasional band The Varaflames, titled Unlimited Mileage, and the release on CD for the first time of his debut album Do You See The Lights? which first saw the light of day in 1970. Showcasing an exemplary taste in interpretations alongside his own songwriting, a Noakes show is a decidedly non-fusty lesson in the history of popular music. 2010 sees the release of no less than three new albums from Rab. One is a live one from Edinburgh in 2005. One is a collection of songs by Boudleaux & Felice Bryant and the other Standing Up Again is a new collection from 2009. Rab's first album was released in 1970. Thirty years later in the year 2000, Rab formed his own record label and released a couple of new releases. In the intervening years Rab Noakes has made his presence felt as a creative entity across music and media. From being one of the singer-songwriters of the 1970s to his present activities with Neon Productions he has released almost twenty albums and toured extensively. The once sought-after hit single remained elusive but didn't impede his progress. In recent years he has been involved in a rich mixture of production, writing and performance. Before he and his wife Stephanie Pordage set up Neon in 1995 he spent an eight-year spell as a BBC employee where he ran the radio music and entertainment shows in Scotland. A formal job in radio was appropriate as the radio had played a major part in Noakes' creative development from an early age. In 2009 Rab has joined forces with Allan Taylor for a number of joint shows based on their similar careers and parallel experiences. Having sat on the Scottish Arts Council for four years Rab was appointed to the Joint Board of SAC & Scottish Screen in 2006. Rab is also elected Chair of the Executive Committee of the Musicians' Union.